If there is one thing that has helped me to get my diploma in psychology and will hopefully help me to get my PhD in it too, it’s Circus Ponies Notebook. While I did the writing of my PhD thesis with Scrivener (a program I can only recommend for it), the information for the writing “marathon” (took me about 27 days to write 59.820 words or 378.535 characters, resulting in about 250 pages) was all collected and structured in Circus Ponies Notebook first. Circus Ponies Notebook (CPN) is easy to underestimate. On the first glance it’s simply the digital version of a paper notebook. It takes a second look to realize how extremely powerful a digital “paper” notebook can be. Why would anyone want to have a digital notebook? Isn’t this just a plaything? Nope, it’s not. CPN uses the notebook metaphor stringently, which is convenient, familiar, and actually quite useful. Given that it is digital, the “paper” can have any length, and you can easily add or restructure information, something that is almost impossible with a real paper notebook. It also has a number of very powerful functions that are now discussed in detail: Outlines (optionally with dates, checkboxes, keywords, stickers), links (internal and external), text highlighting, register (manually and automatically), keywords (tags! ), media attachments, sticky flags & notes, and reminders. Some of the possible things you can do with Circus Ponies Notebook. Especially the outlines and the tagging of individual outline cells with keywords (tags) are killer features of this program. Very powerful. Pages in Circus Ponies Notebook can be accessed via a page turn icon, a back to previously seen page and forward to next seen page (comparable to the browser back and forward buttons and very helpful if you jump between pages), tabs, stickies, search results, Table of Contents, Indexes, and much more. While CPN uses the notebook metaphor, the digital format gives it a flexibility and speed that is unmatched by paper notebooks. You probably learned in school never to write a longer text without an outline. And a good outline is far more than a table of content, or a simple structure. An well developed outline can contain all the information you need for writing, so not only where you want to write what but also the concrete content. I’m going to write another blog entry on this, but in short: if you have all the information you want to write in one large outline, you can easily change the structure until you find an order that is logical and without holes. If you start writing, you will find that the sentences stick together, not only because they already refer to each other, but also, because you will be unwilling to destroy your hard work. Staying as long as possible in outline form results in a “text” that contains all the information in the correct order but without the words to connect them. CPN makes outlines extremely easy to handle — you can simply write the text, press enter once or twice depending on your settings, and you get a new cell. Each cell can be as long or short as you want and you can easily change the position. Cells that belong to other cells can be expanded (shown) or collapsed (not shown), allowing you to compare different parts of the outline and quickly find what you are looking for. 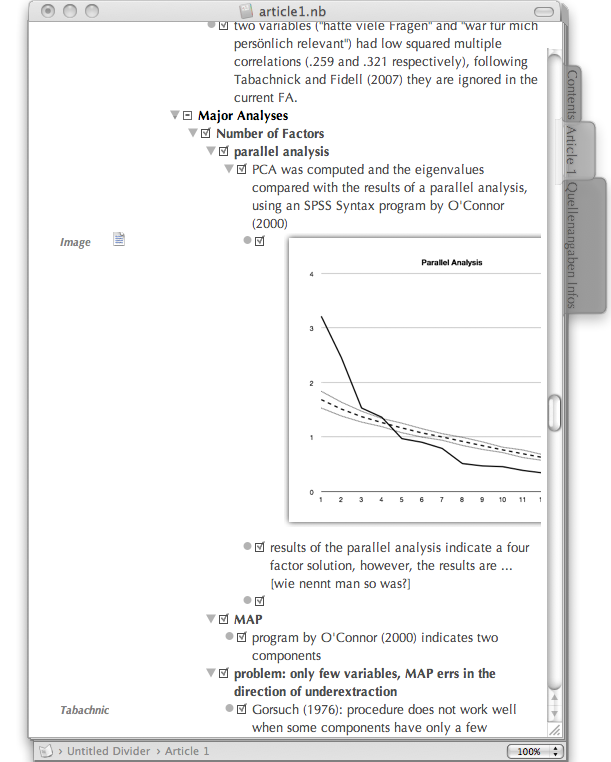 Outlines in CPN are something completely different than the “layout view” in Word or other programs. If you break down your text into outlines and have a cell per future sentence or even part of the future sentence, you can easily shift the order. You can also condense information on higher levels of the outline. For example: You are writing down in detail what a particular statistical process does, then you create a new cell above these cells and write only the main points in this cell and shift all the detailed descriptions beneath this cell. If you collapse the cell you see only the main points but if you need more detailed information, you can easily dive deeper. This is also great for results of research — you can go from the tiniest t-Test and collect different results under more and more abstract parent cells. Outline cells in Circus Ponies Notebook. The cells are highlighted and you can see which are expanded (triangle pointing down) and which are folded in (triangle pointing to the right). 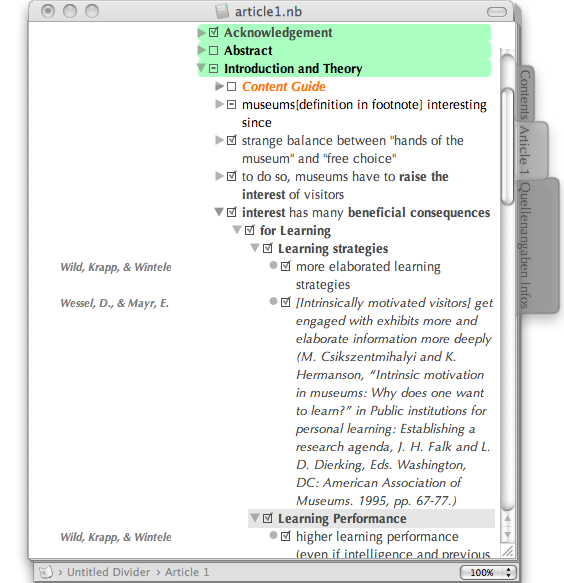 Great to organize notes on a higher level. BTW, there is also an Autosort-Function for outlines — any cell can be set to autosort (e.g., Alphabetize), resulting in all children cells be be sorted automatically when you enter something. This is great for lists. One extremely powerful feature of the outline cells is that they can also display a checkbox. Imagine you have a large outline. You expand it completely (via an icon), select it all (via cmd + a), then right click on any cell, select “Add Status Checkbox”, and all of your cells have a small checkbox in front of them. Whenever you are finished with one cell, e.g., you have used it in your word processing software, you click the checkbox. The cell gets grayed out. Sounds tedious? Not really, actually it has two very beneficial consequences: first, you never get lost anymore what you have already written (given that uninterrupted writing is rather rare in times like Twitter and always-on cellphones), and you see what you have already written, which I find highly motivating. A Circus Ponies Notebook in use. The checkboxes help to stay on top of your writing material when you write longer texts. You can quickly resume writing even after longer interruptions because you can easily see what you have already used and what not. Text isn’t everything. Sometimes you need graphics, sound files, movies, whatever. CPN is very media friendly. It displays Images and PDF-files (you can even select which page should be displayed) and allows you to view video files and hear sound files in the application (it can even record voice notes for you). Any file CPN does not recognize gets displayed as an Icon — you double click it and the corresponding application opens it. 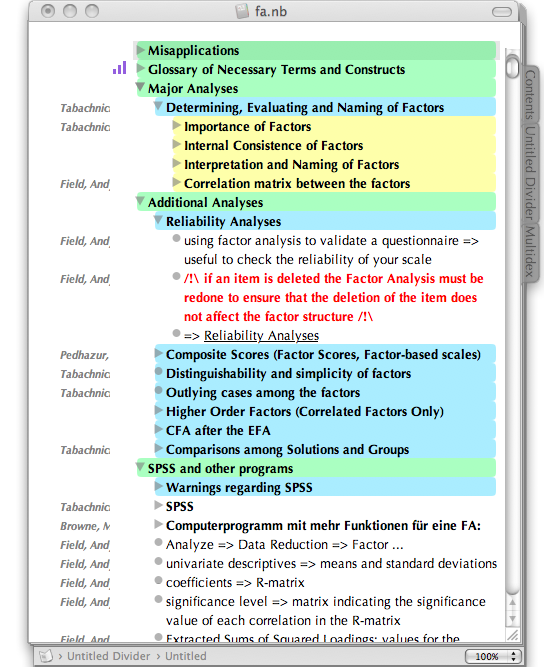 Great for SPSS, Excel, Word, etc. files. When dealing with media you can either embed the file into the Notebook or only link them to the Notebook file. For example, if I am writing a blog article, I copy media files directly into the Notebook I use for blog article writing. But my Bibliography uses only linked files (at least, for the documents that are displayed there). All files are in one directory that is secured separately from the CP Notebook file. Very convenient to save storage space. Oh, by the way, Circus Ponies Notebook files are actually directories which makes the saving fast and secure. Adding Graphics is easy and very helpful if you work with complex data. Each cell in the outline can be tagged with one or many keywords. All used keywords are listed in the Multidex (see below). I usually use keywords to make sure that I remember the source of the information in the outline. All my notes to articles are in my bibliography notebook, one article on one notebook page. All cells on a particular page are tagged with identifiers of the article (authors and year). If I am writing an article, I copy the cells I need to the outline of the article. The keywords get copied as well, so when I’m writing the article I have the information and (very conveniently) the source. This is much better than writing the source directly into the text. It would take me ages (even with copy and paste) and distract. I’m going to write an blog article specifically to Academic writing soon where I address this in detail. Tagging cells with keywords allows you to easily see which source you must reference when you are writing your text. Later I changed the notation to authorname_(authorname_…)_year … much easier. Text can be formatted like in most word processing software. Bold, Italics, Underline, but also Highlighting (shown separately in the Multidex (see below), colors for text, etc. can be easily assigned. If you use the notebook for appointments (there is a nice function where you can enter due dates for individual cells) there is even an date-dependent auto-coloring option. Usually I color cells I use as headers in the order I sorted my crayons as a child (green-blue-yellow-orange-red-brown-black) which allows me to quickly see on which level an information is. Text formatting can be quickly done. True to its metaphor, Circus Ponies Notebook can use registers, stickies, and post-its. 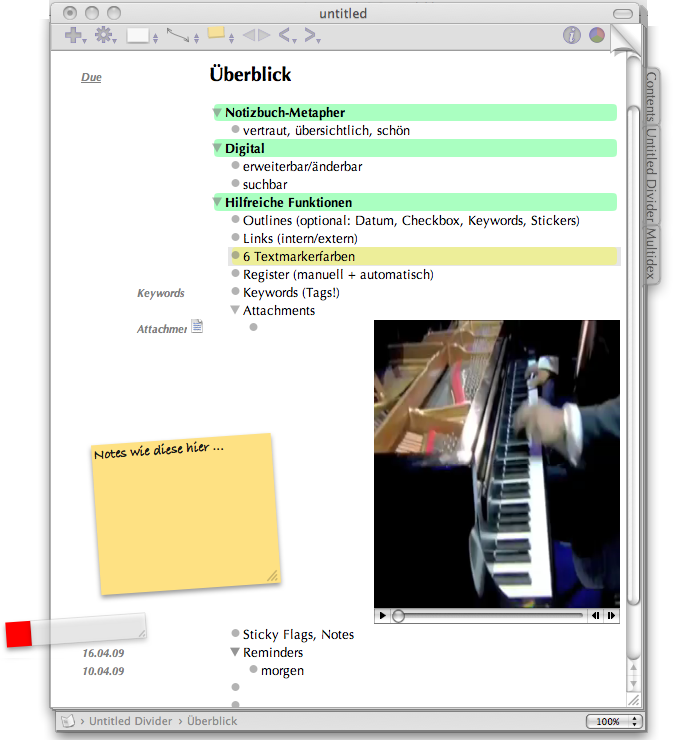 You can skim through the pages by using the arrow keys (or an icon on the top), but you can also use tabs assigned to pages or dividing pages, stickies to mark important pages where you want to come back to regularly, and post-it notes to remind you of things you want to do on that page. It sounds like a toy but it is actually extremely useful: You do not need to search for a particular page by using a search term that will in all likelihood produce a few false hits. Not only a nice gag — the flags help you to quickly move between often used pages of your notebook. You can also draw diagrams with CPN. While its not Omni Graffle (if you prefer to use that, simply drag the file onto the notebook page — depending on your settings it gets linked or saved within the file and is available easily) it is quite nice. 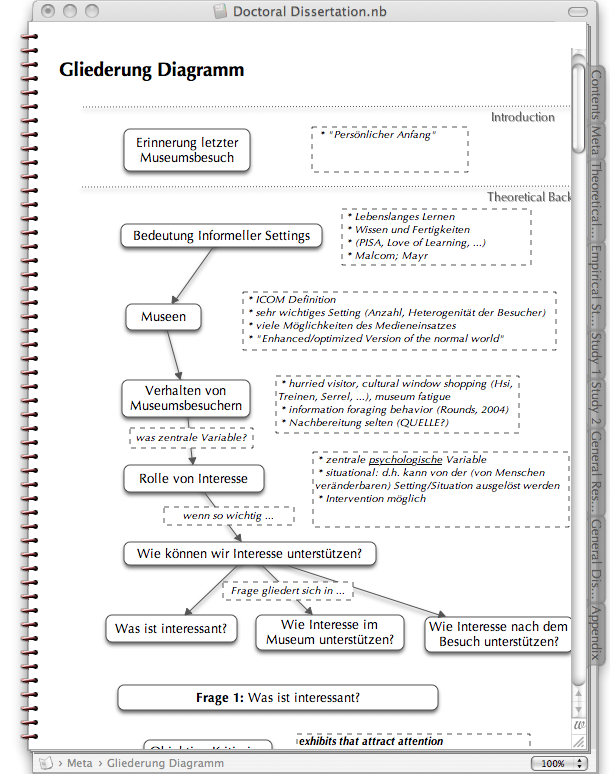 Diagrams can be drawn in the program itself — very useful to plan the general writing strategy. You can even draw on a CPN page and use Apple Ink for text recognition. One extremely powerful feature of CPN is the Multidex. It is automatically updated (and never out of date) and functions like a register. You have pages that show you: Text, Captitalized Words, Numbers, Internet Addresses, Highlighting, Keywords, Stickers, To Do Items, Attachments, Discarded Attachments, Creation Dates, Change Dates, Due Dates, and Super-Find Results. This mean that the Text page shows you the letters of a to z and you can click on any letter and it shows you all the words that begin with that letter and the pages (and part of the sentence the word is part of) they are on. Below is an example for the keywords: It lists all keywords (here: the sources where the information in the cells comes from). A click on a keyword shows you the cells that are tagged with this keyword. The circle in front of each cell is actually a link that brings you directly to that page and cell. Extremely powerful if you have to handle large pieces of information and you get tired of searching for things endlessly. The automatic index is very powerful … esp. the Keywords section (shows you where you have used which source in your notebook). 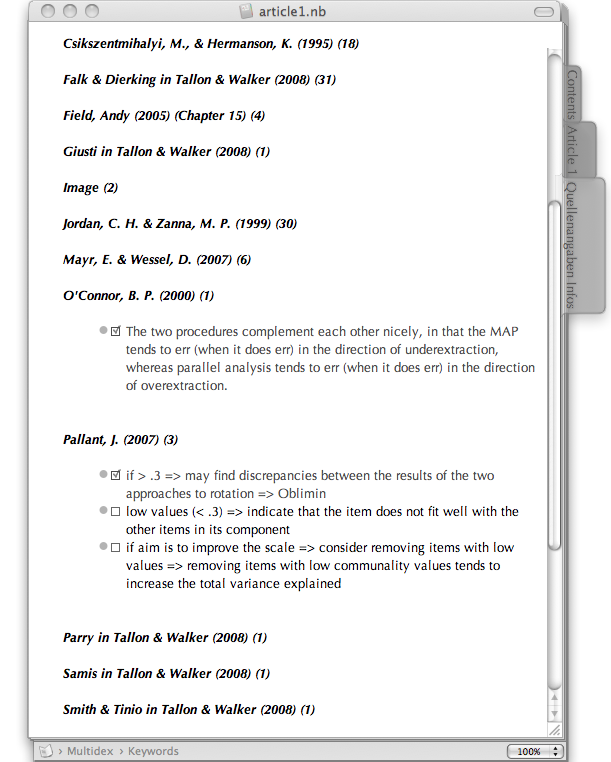 See here for example the source O’Connor (2000) — you can see what you have used from this source and with a click on the bullet point of the cell you can immediately jump to that point. Not only the multidex uses links. The entries on the table of contents page functions as links (the small dots in front of each line) and you can manually set internal and external links. Internal manual links are bidirectional — you can link to a page or a cell and that page/cell gets a snapback-icon. One click on the icon and you get to the page/cell that links to this page/cell. If there are more than one pages/cells that link to the current page/cell, you can choose. You can use links to connect different parts of your notebook — like a website. There are many more features that I haven’t mentioned, like using it for time management (dates, due dates, synchronization with iCal), you can open a page in a new window to compare two pages, send pages per eMail (e.g., as .pdf for those who do not have CPN), use Clipping Services (your right-click menu gets an additional entry — when you select something, e.g., on a web-page, you can send it directly into one of your CPN files, and much, much more. Circus Ponies Notebook seems to resemble a wiki in some aspects (e.g., Links). However, there is a huge difference. Circus Ponies Notebook is extremely powerful, easy to use, and very, very fast. Fast not only in the way the program reacts but also in its usage. You can simply drag and drop items into it. You do not need to press an edit button to change something. While I value my Wiki for it future-proofness and as very large idea repository, I would not use it as the basis to work out a single project. But for this, CPN is simply perfect. There are some things that you should know when you start using CPN. Copy & Paste: There are different ways to paste text into CPN. You can tell CPN to explicitly paste the text as plain text (removing the formatting, which is often convenient if you want to keep the layout of the notebook page uniformly) or as an outline (keeping the formatting but handling each line break as a new cell). If the formatting bugs you but you want to post it as an outline, then first paste it as plain text, double click on that cell, select all (i.e., only the content of that cell), cut, then paste it again but this time as outline. I usually copy-paste everything via TextWrangler (paste it in an empty TextWranger file, then select all and cut it, which also removes any formatting. Enter: If you are using Outlining pages in CPN (and I strongly recommend that you do, even if you want to write one continuous text), you can define what hitting Enter will do. Enter can either insert a new line in the text, ends editing of that cell, or ends editing and adds a new cell. Perhaps they have changed it, but in my version of CPN you have to decide prior to creating a CPN file what Enter should do in that file (via Preferences – Keyboard). I recommend using Enter to “End editing of that cell” — I usually change something here and there in the cell and it is easy to hit Enter twice if I want to create new cells below the current one. Since hitting enter once allows me to use the arrow keys to get to other cells, I do not need my mouse to stop editing of the cell I am currently writing in. While automatically creating a new cell sounds nice, you only spend ages deleting accidently created cells. Mac: CPN is a typical Apple Mac program. If you come from Windows I can only tell you to think naturally. If you want to remove a sticker, for example, you cannot do so by right clicking on it. You will not find a menu item for it either. You remove it be dragging it out of the notebook file with your left mouse key and then releasing the mouse key. It is as easy, fast, and convenient as that, but coming from a world with unnecessary clicks you might think too complicated at some points. Export: CPN allows you to export information, e.g. as webpage, pdf-file, etc. Be sure you know what gets exported. Oftentimes, it is only what you currently see, meaning only the expanded cells get exported. If you want to export the whole file as .pdf per eMail, first expand all cells. I have used Circus Ponies Notebook for four or five years and I did not have any major problems with it. It seems stable even with large amounts of data (e.g., 500 pages, >100 MB). On the other hand, its a proprietary software and there is only a Mac version. You are investing in the continued survival of Apple and that company. However, because you can export your data, e.g., as .rtf, .html, .txt, .pdf, I trust that program, at least for realizing projects. I would not use it as an idea collection, however, as the time horizon for an idea collection is about 30-40 years. Of course, any software has it limitations and some things can be improved — CPN is no exception … only … I’m drawing a blank here … I seriously do not know what would make it any better … there are a few functions that CPN does not have, e.g., it does not work with reference management programs and it does not allow collaborative work. But it doesn’t have to. It’s a program that does best for what it should be used: making notes, structuring a project, especially material for complex texts, etc. I can only highly recommend it for any kind of writing, especially for articles, proposals, and diploma and dissertation theses. Circus Ponies Notebook is actually extremely cheap if you consider what it can do — it costs $30 and it available at http://www.circusponies.com (Mac only). See How to Write a Dissertation Thesis in a Month: Outlines, Outlines, Outlines for a good example of its usage. 1. Do you know of a comparable program that DOES NOT use this notebook metaphor, but looks like a Mac-program (like a finder window or iTunes? I find the notebook metaphor irritating. Or can it be changed in this program itself? 2. Does the program create an index of all words in the files AND ATTACHMENTS, even if the files are linked and not imported? 3. Do search function include such linked files? 1. Circus Ponies Notebook uses the notebook-metaphor and while you can change the appearance of the pages and the book itself, it’s always clear what it is. 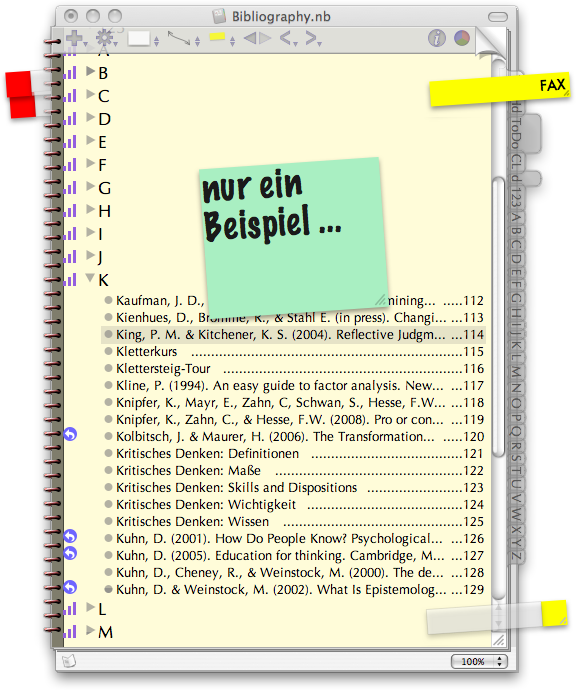 You might want to have a look at Notes Management Systems, there is a list of programs in the Resources-Part of this site, especially at DevonNote or DevonThink. 2. Nope, only the words written in the notebook itself. However, see above, perhaps DevonNote or DevonThink can scan attachments, I’m not sure but I think it’s likely. If I remember correctly they have a trial version. If you try it I’d appreciate a short comment if this is possible and whether it works for you or not. 3. Nope. On a mac, Spotlight would probably find it in the attachments, but Circus Ponies Notebook searches only in the notebook itself, not in the attachments. Note: I can see why this might be important (index of words in attachments and search function of linked files), however, I usually make notes about the documents where the information I search would be included. Scanning all attachments would lead to a huge amount of additional words, consequently hits (or rather: false alarms), and would not help me. But like said, I can see why this is important for some uses, and perhaps, there DevonThink or DevonNote have their strengths. First to your question. Yes, DevonNote indexes also linked documents, unfortunately with one exception: emails. In the now current version, you cannot link an email, but only import it (drag+drop). This creates a new entry, and the body of the mail is scanned and shown as a picture which is not indexed and cannot be searched or altered. The reason I appreciate the index is that I usually do not know beforehand what I’ll need of a document and don’t want to excerpt it in advance. Deciding in real time what is salient – and finding it – is the great advantage of computers. And now to one question of mine that remained open: NoteBook and NoteTaker both work with a notebook-metaphor. Do you know of a comparable program that doesn’t? This would be nice. thanks for your comment — iprocrastinate reminds me of Things which is a nice task manager (albeit commercial). BTW, perhaps Evernote would be something for you. PDF, say WORD, MELLEL etc.? Does NoteBook index such linked or attached documents or search them? 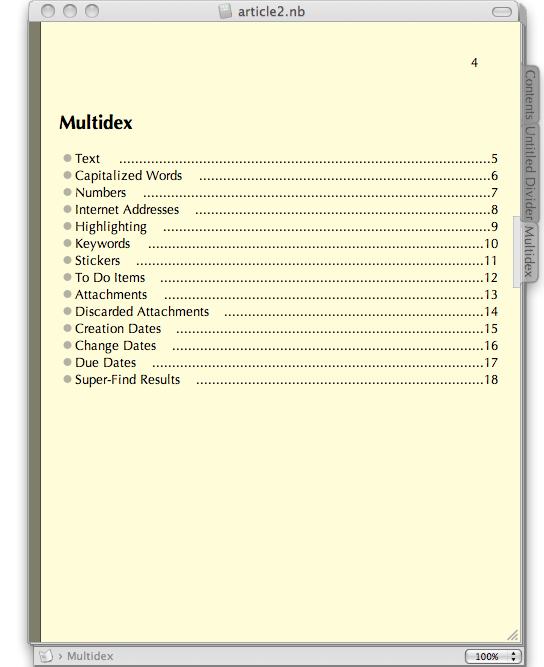 You can attach/link any type of files to NoteBook and they will be indexed in the attachments section of the Multidex. And may I remind you of my unanswered question? NoteBook and NoteTaker both work with a notebook-metaphor. Do you know of a comparable program that doesn’t? hmmm, I suppose there is a confusion regarding the meaning of “indexed”. Any added documents are listed in the Multindex als attachments, but this does not mean that its contents will be found by a search (with “Find” in Circus Ponies Notebook). So, yes, they will be “indexed” but not searchable directly from CPN. Regarding a comparable program that doesn’t use the notebook metaphor — like I said, DevonThink for example. Depends on how strongly you see a notebook in such a program — and your needs. Like I said, you might also try to have a look at Evernote. If you find a program that doesn’t use the notebook metaphor, I’d appreciate a comment. Do you think Circus Ponies would add anything, since Scrivener does have tools for outline etc? 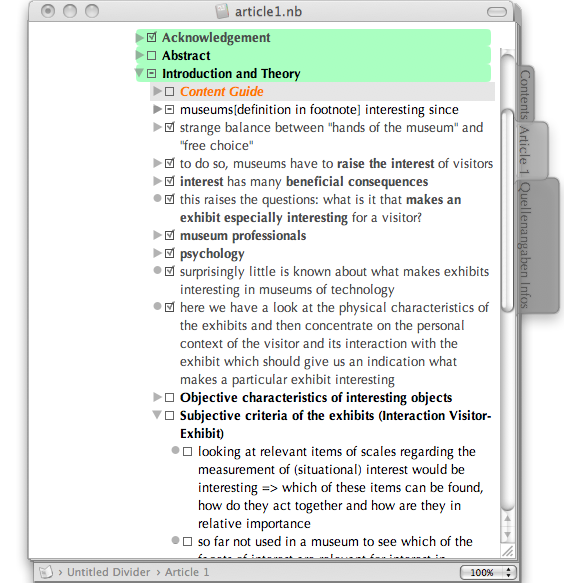 Did you at all work with Endnote or the like for your PhD, and how did you manage that with Scrivener (I know it is possible, but not too handy). yeah, I think that Circus Ponies still is best (and better than Scrivener) when it comes to planning an outline. Have a look at the entry Circus Ponies Notebook for Academic Writing (e.g., Thesis Writing), which also shows how I did handle the references, and How to Write a Dissertation Thesis in a Month: Outlines, Outlines, Outlines regarding the value of detailed outlines (where everything is included that you need to write it down). So, while I think that Scrivener is the best program for writing, I think Circus Ponies Notebook can greatly assist writing by collecting and rearranging the content in a detailed outline. A bit behind the times here, but I would suggest OmniOutliner as a good replacement for Circus Ponies Notebook that doesn’t use a notebook metaphor. External links, embedded or linked files, outlines of outlines–it has quite a lot of the same features as CPN. I haven’t tried version 3 of CPN, but I did find versions 1 and 2 a bit unstable; by contrast, I don’t think I’ve ever had problems with OO. Having said that, your artilce has piqued my interest, and I think I’m going to take a look at CPN 3! You’re right, OmniOutliner is a very good outliner, tested the trial version ages ago. Excellent company (didn’t they also port Quake 3 Arena? ;-)). However I stuck with CPN because I love the metaphor. But yeah, like said, the processes are what matters, tools — not so much. 1. Rather than using a full APA-style reference as a source’s page title, I’m using a modified citation format like this: Falconer/Finlay/Fincher/2011. That form is also what I use as the keyword displayed in the margin. I’m avoiding the full reference because it’s way too long to be readable at the top of the page (and probably on index pages, too), and using a space-less format means it hopefully will be reusable on any other system (such as citeulike) where I may want to use it in future. Of course, I also include the full reference, in the first cell on the page. 2. I want to make sure my notebook has enough intentional metadata, beyond the automatically generated stuff. So I’ve been experimenting with applying multiple keywords to cells. Those apart from the source reference are made simply by me selecting important words and using the contextual menu to Assign as Keyword. I kind of wish it were possible to make multiple keywords visible in the margin when space allows, but unfortunately it seems that, even if you assign multiple keywords, you can only actually see one of them (though the others are of course available to the indexing tools, which is the main purpose of using them). Because the keywords are a little bit fiddly, I experimented with using highlighters on important words, thinking highlighted words would serve as a substitute for keywords. Unfortunately, though, the index will show only cells that have highlights, rather than highlighted words as separate items. interesting ideas, I’d be happy to hear how it works out for you in the future. Personally, using keywords for the cells and then using the cells like Lego blocks to build my articles did it for me, as every building block had the source easily visible attached to it. So I’m not so sure about the multiple keywords thing and I would be interested in an update how it works out. Can any of these programs act as the front end to data stored in conventional data bases (not including DTP, Yojimbo, et al)? Good question, what do you want to do with the program? Hi Daniel, I wonder what font did you use for the notebook contents? it’s very nice and easy to the eyes. Hoi — This was probably the default font, Optima if I am not mistaken. Is One Note comparable to CPN? I’m not blessed to have a Mac. Not sure, I’m not using One Note, it looks similar in some ways, but I think it’s lacking the look and feel. Also not sure — does One Note have Outlines? I was wondering why you switched to Scrivener.. could you not have just written it directly in CPN?? while CPN is very good when it comes to making a content outline, I would not want to actually write a scientific work in it. If you compare it with scrivener you see why — Scrivener is a writing software that makes writing easy, let’s you focus on the crucial issues, offers you targets, auto-backup, Snapshots of prior versions, a full screen modus to revise the text in. As powerful as CPN is, it cannot offer that — and it should not, it was made for a different purpose. 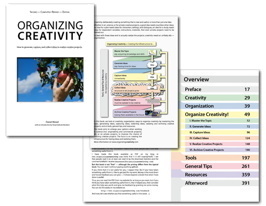 I am a Professor trying to make more efficient its workflow to produce academic books (ex. manual). I use DevonThink Pro and I have just bought Scrivener. Do you think that it is useful to use Notebook in between ? And if yes, what are your arguments ? This is something that you cannot do with Scrivener or DEVONthink — but of course, whether it is actually useful for you depends on how you work. 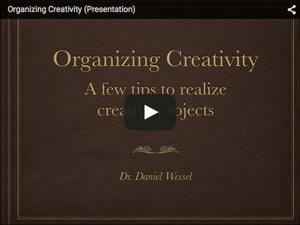 I am actually looking for a program to organize and to code my papers for my thesis. 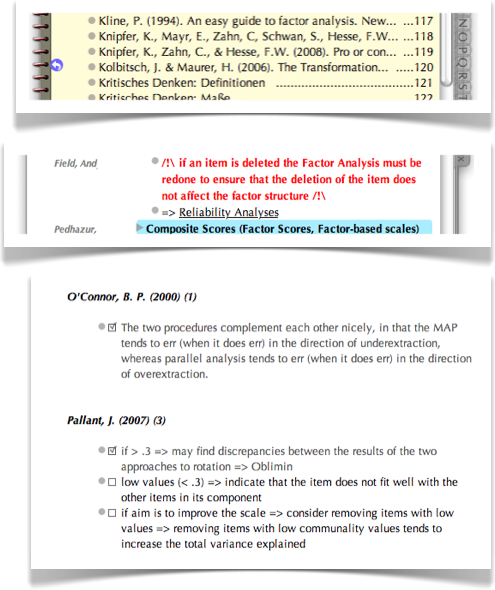 I would like to code my paper regarding different topics, so afterward I can see which paper I can use for each topic. Would this program be able to do this? Hoi, I’ve written a reply in the today’s posting (Using Circus Ponies Notebook to collect and sort information for your thesis (or article)). Hope it helps. If you need a copy of NoteBook 4.0 (3.x and earlier don’t run on OS X El Capitan) or need technical support, you can try sending an e-mail …There’s a chance someone will respond but no guarantees. Since most of MAC users have El Capitan+, any thoughts? Microsoft cloned NoteBook in the early 2000s to create the craptacular OneNote — should we give that a whirl? Or at this point should I just use Scrivner as my outliner? Good questions — I have started to use OmniOutliner. Works for me, but it lacks a high level integration of the different outlines (using only one outline per notebook is not an option for me, so I use an outline for each CPN page). I would not use OneNote, but that’s due to personal antipathy to Microsoft and a deep distrust to anything that requires online registration. So, frankly, I think the only workable solution is to use this … really-bad-event to try out different options and use the one with which you can create best. If that’s OneNote, then that’s it. If it’s Scrivener, then that’s it. For me, like written, OmniOutliner — and looking for a way to tie the different outlines together.